The days of one-size-fits-all suites are behind us, and flexible integration is on the rise. But what kind of results can you expect from a cutting-edge iPaaS like Dell Boomi? To answer that query, we took a look at the Dell Boomi benefits. For many years, enterprises were stuck with ERP suites. Instead of making a best-in-breed collage to suit their real needs, they had to choose one package or another. As the cost of ERP implementation increases, more and more enterprises are seeking alternatives. The most compelling of these are the integration platforms as a service (iPaaS). With an iPaaS such as Dell Boomi, businesses of all sizes can connect any mix of software as a service (SaaS) applications with on-premise systems – so they get only the best for their business goals. But the Dell Boomi benefits don’t stop there. At Influential Software, we care about sustainable results. So is Dell Boomi the right option for your business? A successful integration has long-term benefits for businesses – while an unsuccessful one can cause chaos. That’s why vendors choose to sell their products through experienced partners such as Influential Software. As a Dell Boomi Partner with 25 years in the industry, we have some of the best-qualified consultants in the UK. And read on for the full picture of Dell Boomi benefits. Growth is good. An effective iPaaS offers quick adjustment of functionality, scaling up and down as you need. Forget the expense of onboarding and maintaining all that hardware and software. There’s none of that with the Dell Boomi iPaaS! Fine, but let’s say I want to add subscription billing and human capital management application to Salesforce Sales Cloud and another cloud-based ERP application. Yes, you can do that too: just plug in a pre-made Dell Boomi enterprise connector or application connector. Key benefit: save time and cost of growth. 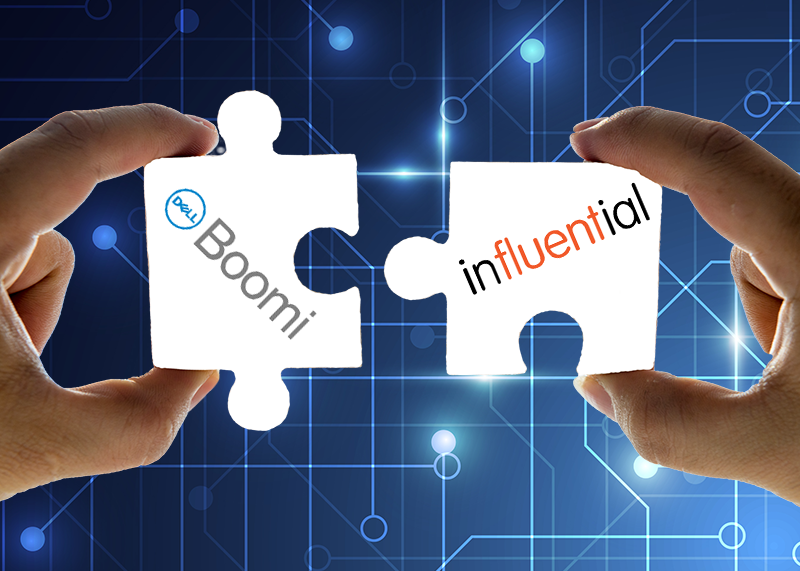 Boomi Suggest: anonymously indexes data mappings across all platform users – so 90 percent of data mappings you need to create are already mapped and presented as options. Boomi Resolve: uses crowdsourced contributions to suggest resolutions for common error messages. It even learns, becoming more helpful as more issues arise. Key benefit: reduce integration risks and resolve obstacles fast. Struggling with redundant applications, or sharing data across line-of-business applications to systems that are only used at HQ? You can automate that with a scalable iPaaS like Dell Boomi AtomSphere. A smart business has one eye on the future. For many, that means MDM or API management. The Dell Boomi iPaaS is one component of a multi-purpose PaaS solution, meaning you can pick up other functionalities whenever they’re needed, with no need for another platform, vendor, or interface. Key benefit: automate processes and future-proof your integrations. All in all, a well-functioning iPaaS such as Dell Boomi galvanises communication, intelligence, and productivity across your enterprise. The end result: profitability! If these sound like benefits you want to have, get in touch with the Dell Boomi Partner team at Influential Software.